Miwako Tezuka talks about the introduction of felines into Japanese society, cats catching giant squids, and ancient Japanese cat horror stories. Recently I was forwarded an email that involved the phrase “Life of Cats” in the subject heading. Naturally, this was a forward I actually bothered to read — and soon discovered that on March 13 the Japan Society in New York City will be opening its doors to an art exhibition that explores the way the esteemed feline has finagled his way into Japanese folklore and art. Seems like a fine premise for an artsy jaunt to me. 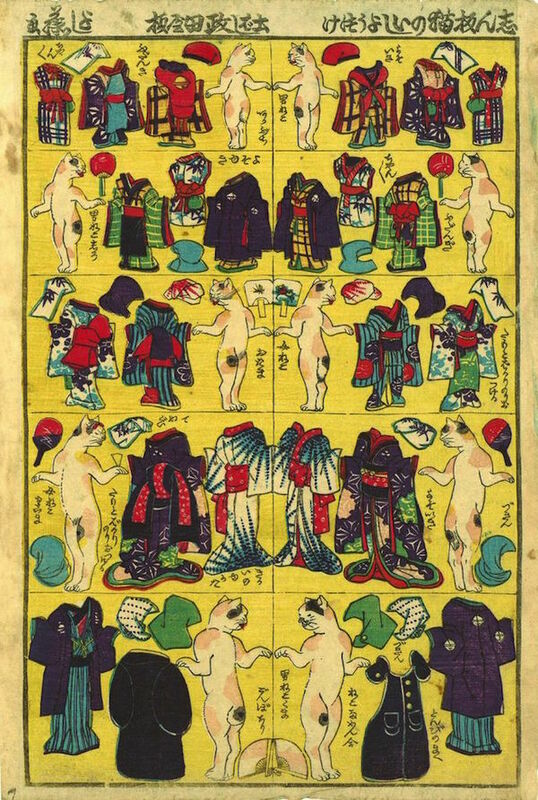 Ahead of the opening of Life of Cats: Selections from the Hiraki Ukiyo-e Collection, I spoke to its curator, Miwako Tezuka, about the grand historical introduction of cats into Japan, the days when it was common practice to walk your feline, and the pet-rifying (sorry) cult of cat-horror stories. 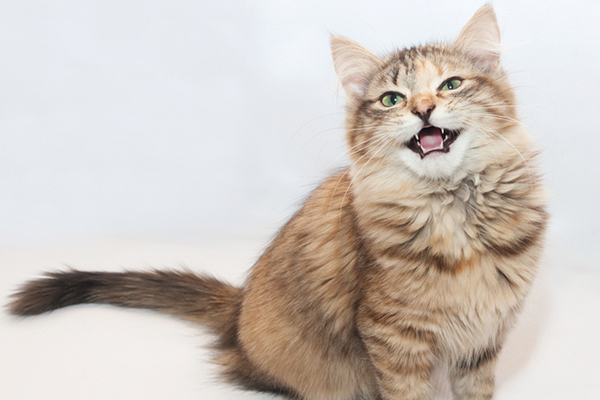 Catster: Is it fair to say that Japanese society is a little bit obsessed with cats? Miwako Tezuka: I think you’ve got that right! It certainly feels like an obsession. I was there last month for about two weeks and there’s always something happening about cats — this time one of the Japanese subway lines did a competition to find cute cat photos, so they had all the images submitted to the competition all over the subway cars. So, yes, I would say it’s fair to say there is an obsession — and there’s certainly a long-lasting love affair between Japan and cats. woodblock print; 22 ½ x 16 inches. Courtesy of Hiraki Ukiyo-e Foundation. Have you come across any theories as to where this obsession comes from? It’s interesting because I did a ton of research for this exhibition and it turns out that cats weren’t actually native to Japan — they came mostly from China when Buddhism as a religion was being introduced to Japan. So cats were protectors of Buddhist scriptures that were transported to Japan on ships. They were basically trying to keep the mice and rats away from those important objects. So they came to Japan with this revered image — they were respected animals who helped transport this important religion to Japan from abroad. The first introduction of cats to Japan was on a positive note, and then people became truly fascinated by this exotic animal. I think it really started to create these legendary stories and folktales about cats; that was in the mid-sixth century. 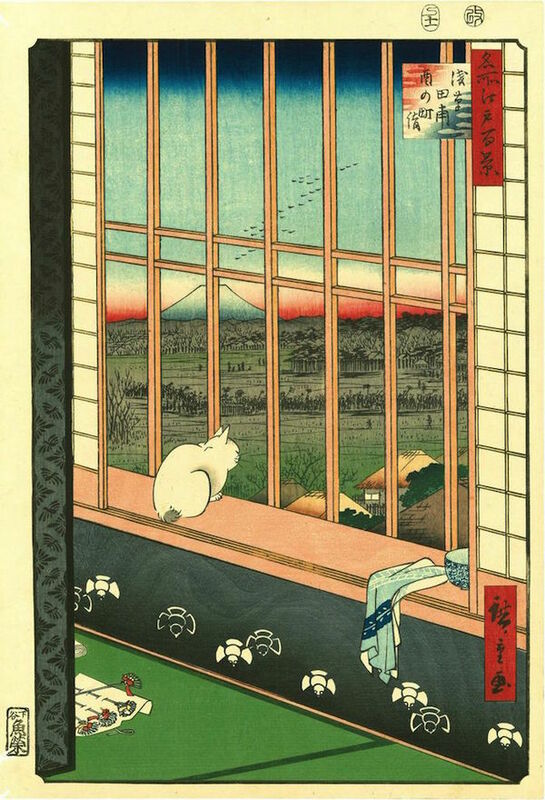 Utagawa Hiroshige (1797–1858), Cat Crossing to Eat, 1830–44. Color woodblock print; 22 ½ x 16 inches. How did you go about selecting which images were going to make it into the Life of Cats exhibition? I decided to have several sections: Cat and people, cats as people, cats versus people, transformed images of cats, and also images of cats at play. In each category I wanted to show how cats relate to people, how they were domesticated, how they were feared through horror stories, and how they became beloved animals amongst kids, and then I decided to pick images to work with these sections. I tried to go with images that are visually playful and whimsical and with lots of historical context. 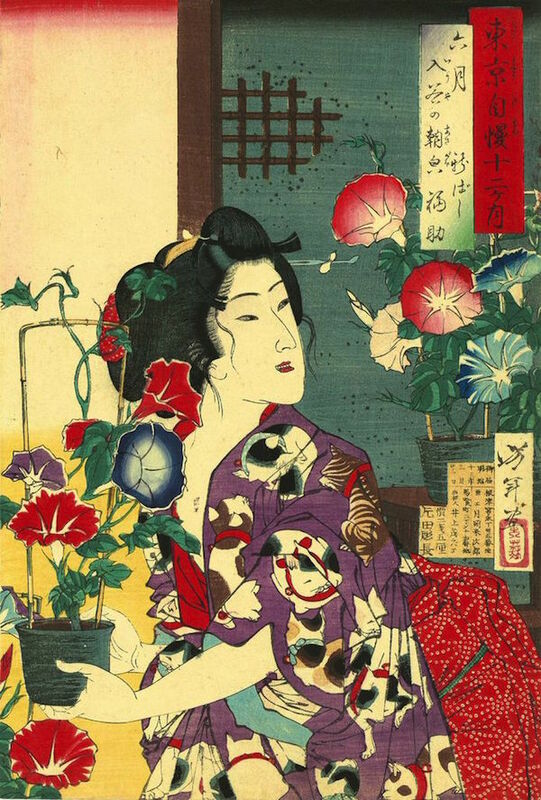 Utagawa Kunisada II (1823–1880), Kashiwagi from the series The False Murasaki’s Rustic Genji, 1848–54. 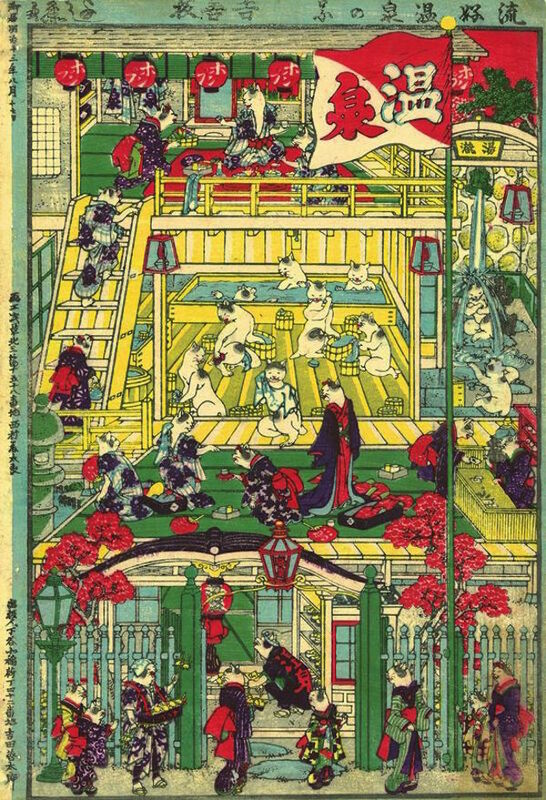 Color woodblock print; 22 3/8 x 36 7/8 inches. Courtesy Hiraki Ukiyo-e Foundation. There seem to be a number of images of cats being taken for a walk on a leash. Was that a common practice at one point? 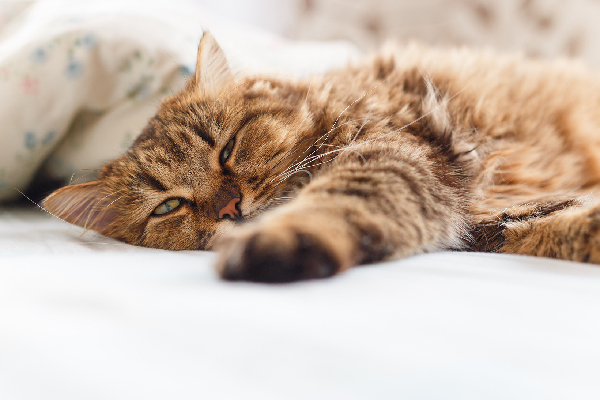 Yes, in the beginning, as I mentioned, cats were seen as important animals so they were kept inside households and kept on leash until about the 12th century. It was because they were usually seen as these precious and exotic animals. While looking through the images in the exhibition, I noticed that most of the cats are white with black markings. Is there a reason for this? Actually, there were many different varieties, so I’m not sure if white cats with black spots were the most common. 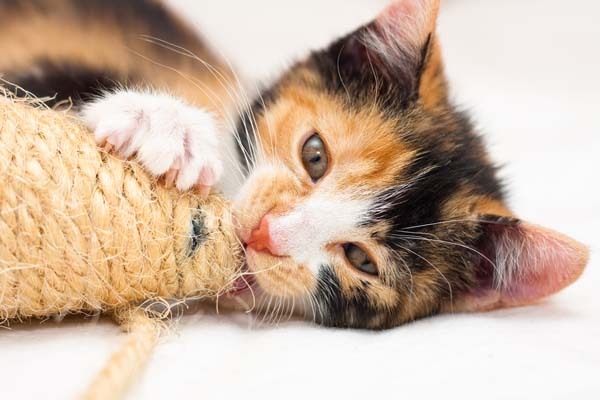 One of the patterns that were particularly valued were calico cats with the three colors, especially the male calicos, which are apparently very rare. They were considered to be a very valuable animal. woodblock print; each sheet 14 5/8 x 10 inches. Courtesy Private Collection, New York. One of the images involves a cat who seems to have successfully caught a giant squid. Is there some mythology behind this? Ha ha! The cats were known to be mischievous a long time ago, so they were depicted in their actions when they were stealing something. Sometimes it might be a squid, sometimes it might be a fish, sometimes clams, sometimes even types of dried food products that cats have always favored. So, I don’t think there’s any particular reason why it’s a giant squid! the series Thirty-two Aspects of Customs and Manners, 1888. Color woodblock print; 22 ½ x 16 inches. You mentioned horror stories involving cats. Yes, we have a whole section about horror stories relating to cats. 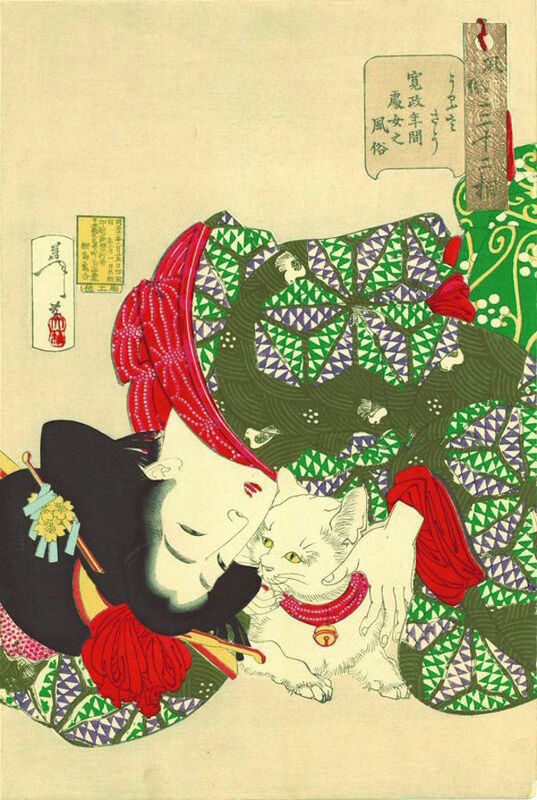 There are many different varieties of horror stories involving cats, and it seems to have really triggered the curiosity of people during the Edo period, which is from the 17th to the 19th century. 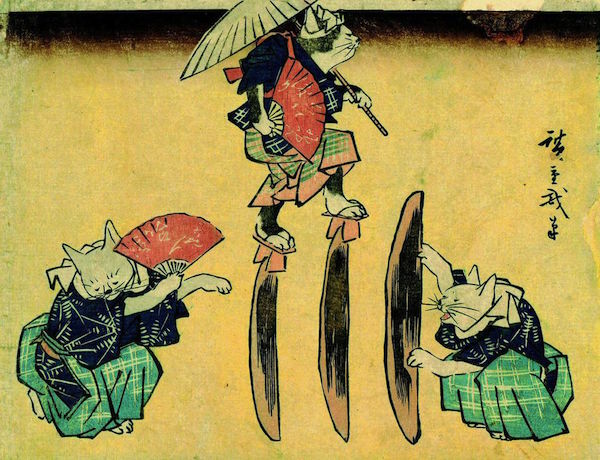 During this time there were a lot of publications, and the literacy level in Japan was quite high, so people could read folktales from different regions, and various cat-related horror stories became circulated widely throughout Japan. Some were also theatricalized for the theater. So we have a number of prints that depict those dramatized versions of the horror stories. What’s your favorite cat horror story you came across? I think it’s one that became popular and was made into a play, which is about this cat-shaped stone that was found in one of the 53 stations along Tokaido. It is said that the stone is the embodiment of a wrongly murdered lady and at night the cat stone turns into the murdered lady and haunts people, so there would be fights between this monster cat lady and warriors who were traveling through that region. It’s a famous story; I think that’s the most commonly known cat horror story. inches. Courtesy Hiraki Ukiyo-e Foundation. 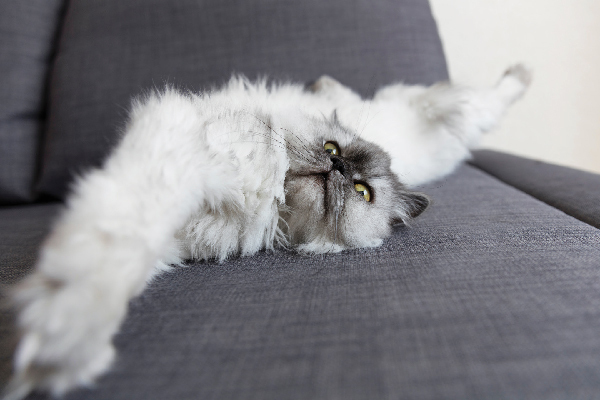 Finally, do you own any cats yourself? I used to! Unfortunately, and very ironically, I love cats and I’m a cat person completely, but I’m severely allergic to cats. I tried to have my two cats, but after a while it became too much and my allergy couldn’t survive. But now I’m lucky to be dealing with cat prints!